It’s hard to believe that 2018 is right around the corner. The year has flown by for us. Our business is continuing to grow, we bought a car with cash, and we’ve been able to take a handful of nice vacations. With the holidays soon upon us, it’s time to start thinking of how you can get on the right financial foot in 2018. I know money may be the last thing you want to think about at this time of year. That’s why it’s the perfect time to think over your finances. If you want to improve your financial situation, now is the time to take a cold, honest look at your money. Here’s what you need to do to get on the right financial foot and rock it with your money in 2018. What progress did you make with your money? How much debt did you pay off, or did you go into debt? What big-ticket items did you purchase? How did your investments perform? What changed in your family or living situation? You may have other questions you need to ask, as it really depends on your particular situation. The point is to be clear and brutally honest with your situation as this will form the foundation of your goals for next year. If you have a partner, make sure to include them as well, so you’re both on the same page. The first thing you need to do to start the year on the right financial foot is to know your goals. This can be easier said than done at times, but it’s vitally important as it will help you know what you want to accomplish in the coming year. I’ve found the key to setting attainable goals is to make them quantifiable and break them up into chunks. For example, saying you want to save $10,000 to go towards a house down payment by the end of the year is great, but a lot can happen over the course of the year. For this example goal, you want to check in monthly, or at least quarterly to make sure you are on track. By breaking the goal into smaller chunks, you make it seem less difficult and easier to reach. You want to achieve the goal, so make it easier by regularly checking in on your goals. If you have debt, 2018 is the year to treat it like an emergency. Many think debt is normal or that it’s okay to have debt and that debt is perfectly acceptable as a way of life. Debt does one thing quite well. It enslaves you to someone or something else and holds you back from living a life of financial freedom. If you have debt, come up with a plan to seriously attack it – especially if it’s high-interest consumer debt. There are many ways to pay off debt. Here are 25+ ways to start paying off debt now. Pick a few and attack the debt with all you have. It’s also important to help yourself in your war against debt. If you are carrying high-interest debt, or multiple balances, look into consolidating the debt. Avant, Lending Club and LightStream are all good options to consolidate your debt and slash your interest rate by half or more. If you have student loans, you can do something similar with SoFi. It is possible to pay off debt, no matter the amount. I’m proof that it’s possible, but you have to start and treat it like an emergency. Do you still have cable TV? If so, why? Recent reports show that close to 25 percent of households have cut the cord; that’s great, but it’s still way too low of a number. I used to think we couldn’t live without cable and I was wrong. We’ve saved over $2,000 in two years since we canceled DirecTV and, honestly, cable is the easiest bill to cut. With very little effort, you can easily save $50 – $100 per month. That’s money you can use for far better things and still not lose out on much of what you want to watch. If you don’t have cable, great! Your challenge for next year is to find another bill to slash to save more money. I’m a big believer in the power of earning extra income. Extra money can be a great tool to help you do anything from paying off debt to having money to save for retirement, travel and much more. It was my desire to earn extra money on the side that basically led me to quit my job and help my wife run our business. The Internet is full of similar stories, many of them having a wide array of different jobs and services but all with a similar drive. Saving money is great, and I obviously support saving money, but earning more is better as it’s limitless. You can do virtually anything to make extra money, from taking on more shifts at work or asking for additional responsibilities to starting a side hustle. Many people think you need special skills to earn extra money. You don’t. There are many ways you can make extra money; you just need drive and a willingness to act. Here are 60+ ways to make money fast and I guarantee you that you will find a handful you can do to bring in some additional income. If there is a financial goal you want to reach in 2018, extra income is the next best thing, after killing debt, that you can do to make that goal a reality. The final thing you need to do to start 2018 on the right financial foot is to make a plan. This should flow out of findings from your year-end assessment and your goals for the year. This plan will help you know what you are aiming for, but remember to break it up into chunks to increase the possibility of success. Let’s take money for holiday spending since it’s the holidays. The average family spends around $800 on Christmas gifts and other related shopping needs. If you don’t have that money saved now, you know the stress it creates. To alleviate that problem, set a plan to save $800 (or whatever you plan on spending) throughout the year. Doing so greatly reduces the risk of going into debt for Christmas presents, which is nowhere near worth it. It also feels great knowing you have the money you need for presents and just being able to buy what you want. The same approach can be taken with anything in your financial life – saving for retirement, saving for a new house or car or saving money for travel, and everything in between. If you need help sticking to your plan, ask a friend to keep you accountable and check in on it regularly. You’ll be surprised at how both will greatly increase your chances of reaching your financial goals for 2018. What are your plans to start off the next year on the right financial foot? What’s one big goal you want to hit next year? Do you do an annual financial checkup? 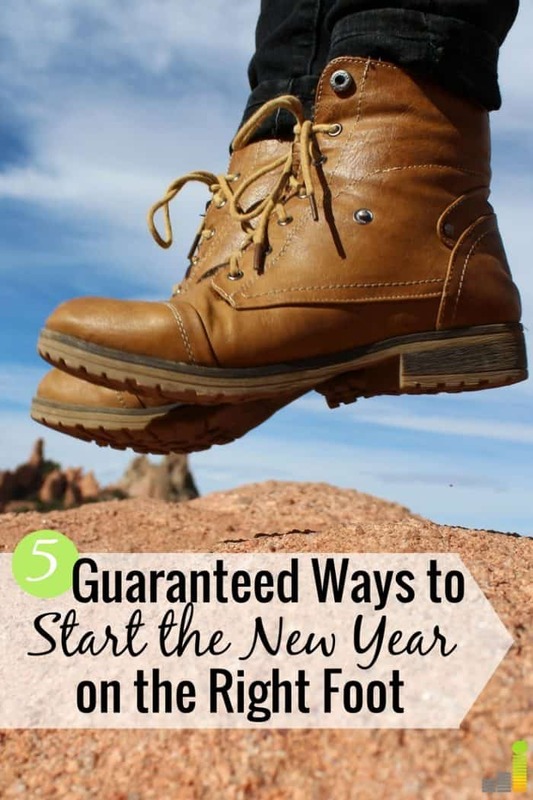 The post 5 Ways to Start 2018 on the Right Financial Foot appeared first on Frugal Rules.